Big Carrot customers showed overwhelming support for an Organic Ontario by raising $6,000 in fifteen days during May’s $2 Today for an Organic Tomorrow Campaign. This type of fundraising was a first at The Big Carrot who felt this was an important opportunity to raise awareness about OCO and the essential advocacy work we are doing in Ontario. The Big Carrot cashiers were inspiring OCO ambassadors who rose to the challenge and helped The Big Carrot reach their goal in half the time that was originally allocated as the campaign period. Big Carrot co-op members were so impressed by the success of the campaign that on May 22, 2013 they voted to match the generous customer donations for a total of $12,000. Securing an organic future of local food production requires having a dedicated full-time staff who can act as the credible voice for organics in front of government policy makers and media, on behalf of the organic sector and individuals who value organic principles. While OCO looks to government grants to fund specific research projects, industry training programs or public education/outreach programs, we need to generate core funding to support all activities related to advocacy. OCO acquires some funding through membership fees, but we must also rely on fundraising to generate the balance of the funding that is required to fund core advocacy activities. Piloting the $2 Today for an Organic Tomorrow Campaign at The Big Carrot demonstrated the incredible potential in raising these critical funds through a fun and coordinated effort between organic retailers and their customers. 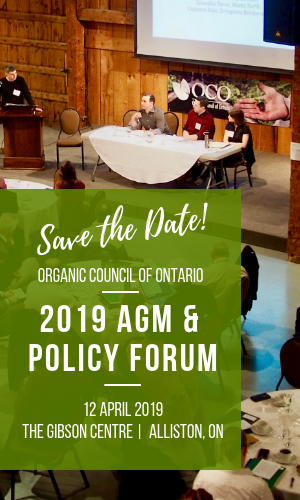 OCO’s goal is to roll out this same campaign across 12 organic retail locations in Ontario leading up to and during Organic Week in effort to raise a total of $36,000, which is nearly 1/3 of the funds required to sustain OCO’s core advocacy initiatives and associated operational costs. The Organic Council of Ontario’s Staff and Board of Directors would like to sincerely thank the Big Carrot co-op members and staff who gave so much of their energy to this campaign as well as their overwhelming generosity in matching their customer’s donations. We’d also like to thank all the customers of The Big Carrot who gave two dollars towards an organic Ontario – re-affirming that no action is too small to make a big impact! If you’re inspired by the generosity of The Big Carrot staff and customers and would also like to give $2 Today help us build an Organic Ontario, please consider an online donation.